Hey, Y’all! I’d like to say a belated but loved filled HAPPY NEW YEAR! It’s 2019!!! And let’s just mention that 2018 was one heck of a year and some of us survived! I have plenty of material for storytelling in all forms! Times were hard. Bullies were in and planet down for the count. BUT some of us are still here and fighting for the right to love! On that note, I formally invite you to a throw-down dance party where I will share the stage with some magnificent wards of the Rhythm & Blues. This Sat Jan 19th, Roadrunner’s Paradise, Berlin. 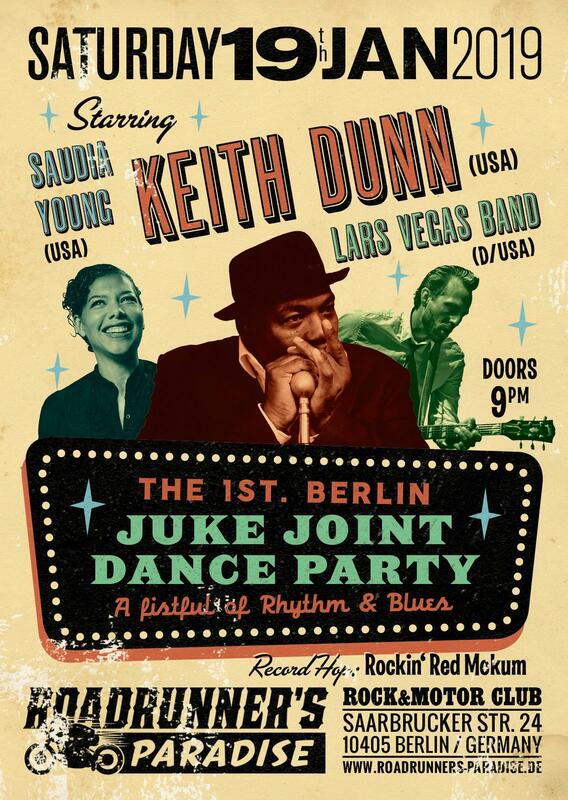 Headlined by Mr. Keith Dunn, with Lars Vegas & Band, and Moi-Saudia Young. Road Runner’s Paradise is stepping up to the plate after several beloved clubs recently closed for good. Bring your Bassy boots and do the Wobble with us.